Bathelen's Nails: What's Lurking In The Dark?? A simple blog about my favourite thing - Nail Polish! Pretty polishes, nail art and bargain hauls, you'll find it all here in the Bathelen Cave! Follow Bathelen Nails on Bloglovin! What's Lurking In The Dark?? Woooooooh! It's Halloween week this week and The British Nail Bloggers have got a wee treat in the form of themed nail art - organised by the lovely Kerrie at Pish Posh Polish! My nail art for this is dead simple - for most my nails I used Orly R.I.P from the Flash Glam FX collection which I found for a fiver in TK Maxx earlier on today. I thought it was not only appropriately titled for a Halloween nail art but it made for an effective background to my simple statement nail. I layered R.I.P over Liquid Leather by China Glaze, which I also used as the base for the statement nail. 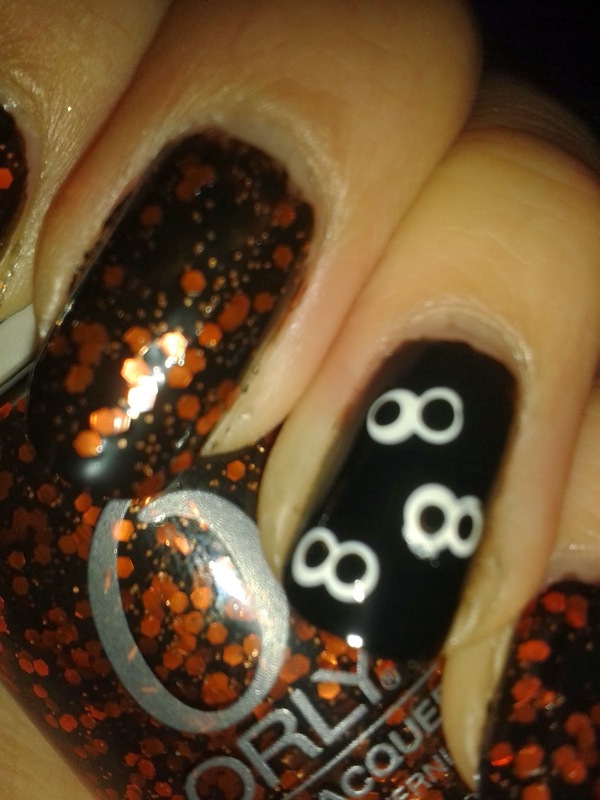 I then made creepy eyes peeking out of the dark with dotting tools and China Glaze White Out (China Glaze is my go to for basic colours like black and white and they never let me down pigment or performance wise!) I really love the indie like scattered glitter of the Orly polish and love how perfectly warm and Halloween-y the colours are - I imagine it'd be really versatile layered over a brighter colour come summer though! 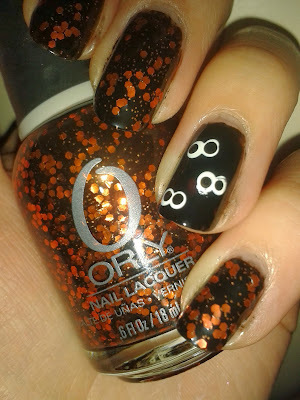 this is a perfect halloween nail art idea! 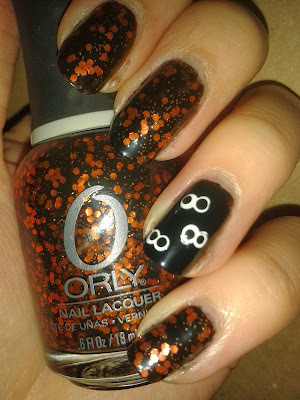 No7 Party Nails are just DARLING! 10% off at Born Pretty Store!! Proud to be a British Nail Blogger!